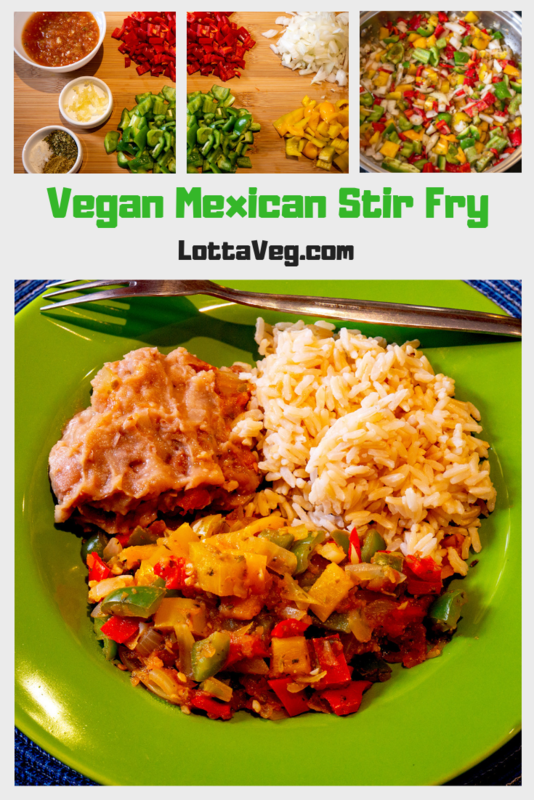 This Vegan Mexican Stir Fry is a great weeknight meal since it’s quick to make and amazingly delicious. Since this recipe only has about 89 calories per serving, you really need to eat it with something else. You can prepare some brown rice and refried beans ahead of time and heat them up to save time. It takes only a few minutes to chop up some peppers and onions, and since most of the flavor comes from the salsa, you can easily have this ready to eat in under 10 minutes. We make ours with my Grandpa’s Vegan Dipping Hot Sauce and Amelia’s Vegan Refried Beans, but you can just as easily use store-bought refried beans and salsa. Just make sure they’re oil-free and lard-free. A lot of canned refried beans have lard. Yuck! This is one of our go-to recipes. We eat this one almost every week, especially on nights when Amelia has her belly dancing class at The Tribal Fusion House here in Cuenca, Ecuador. If you’d like to see her belly dancing, here’s a video. She’s in front on the right. 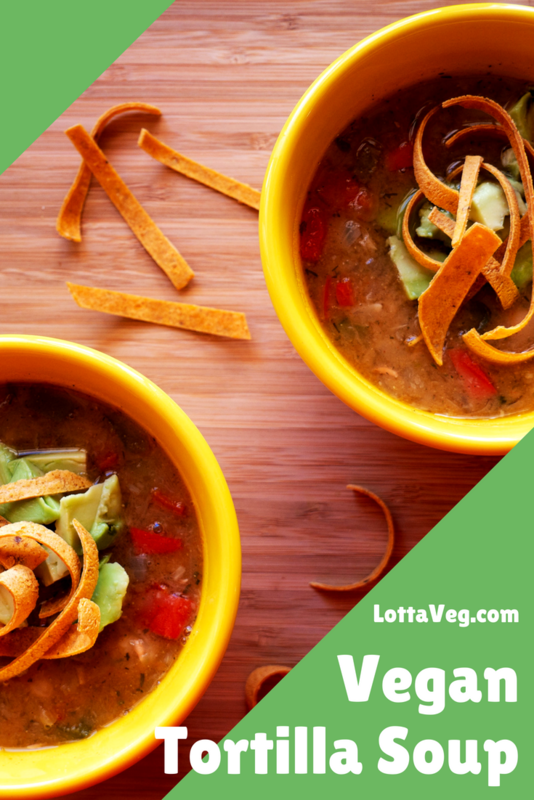 Even though I just finished eating lunch, my mouth is watering just thinking about this Vegan Tortilla Soup recipe! It’s that good! While conventional tortilla soup typically uses chicken as the protein, we used white beans instead. Beans are loaded with protein and fiber, but contain no cholesterol nor measurable saturated fat. They’re also a good source of iron, magnesium and potassium. There are several different types of white beans: navy beans, great northern beans, cannellini beans and butterbeans. We like navy beans in our soups because the starch gets released during cooking, making the soup creamier. 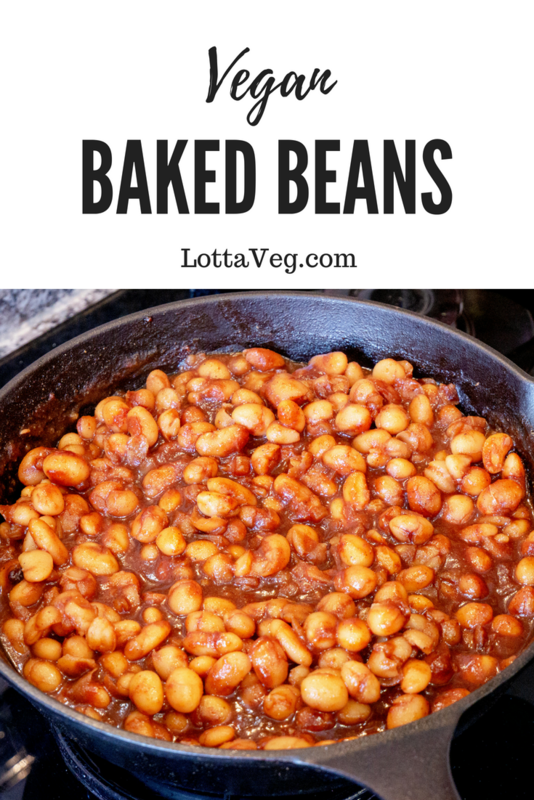 However, you can use whichever beans you prefer or have on-hand for this recipe. For the tortilla strips, we used two small corn tortillas made with only two ingredients: whole corn and water. Whole Foods carries organic corn tortillas that are made with corn, water and a hint of lime. When eating a whole-food plant-based (WFPB) no-oil diet, it’s important to look for minimally processed foods without added oils and sugars (or other mystery ingredients). We cubed some avocado as a topping for our vegan tortilla soup, but if you’re trying to lose weight or lower your cholesterol, you may want to skip the avocado until you’ve reached your goal. Saturated fat, regardless of whether it comes from a plant or animal, will raise your cholesterol and can contribute to heart disease and weight gain. This recipe pairs well with a nice Side Salad or some Corn Tortilla Corn Chips and Salsa. 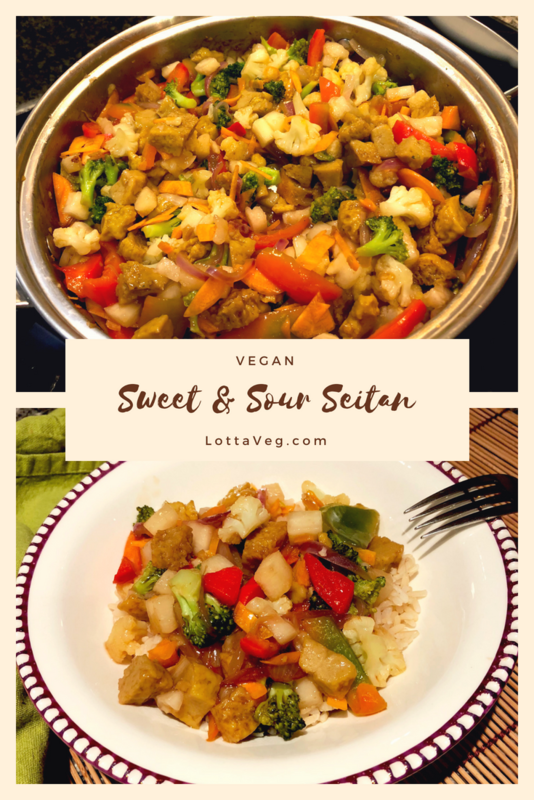 This Vegan Sweet and Sour Seitan with Veggies recipe is sweet, savory and delicious! It’s also a little spicy, thanks to the hot pepper Amelia added. Dr. Esselstyn’s book is full of delicious, low-fat and oil-free recipes. It’s also full of scientific evidence showing that a WFPB diet is the only diet proven to prevent and reverse heart disease. 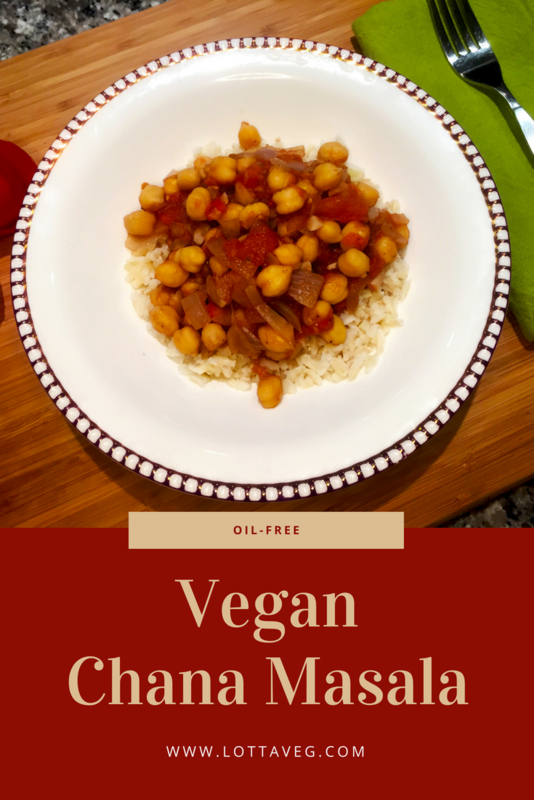 We modified this Vegan Sweet and Sour Seitan with Veggies recipe a little bit by using both broccoli and cauliflower, as well as a hot pepper that we got at our favorite mercado here in Cuenca, Ecuador. We also used a fresh pineapple instead of canned, which meant we had less juice than you get from canned pineapple. We added a tablespoon of brown sugar to make up for the missing sweetness. Finally, we changed the order of things a bit to make it a little quicker and easier to prepare. It’s hard to find cornstarch here in Ecuador, so we use the widely available yucca powder as the sauce thickening agent. You can also use agar powder, tapioca powder or arrowroot. Use whatever you can find. Try different veggies, using whatever you have on hand, or veggies that need to be used before they go bad. Being creative brings new and exciting flavors to recipes so they stay interesting. We got our no-oil seitan from Fratello Vegan here in Cuenca, Ecuador. In addition to delicious vegan food made to order with a great view of the Tomebamba river, they also sell seitan, vegan chorizo sausage, vegan desserts and other vegan foods that can be hard to find in grocery stores. While the plant-based and vegan movements are growing rapidly here in Ecuador, the grocery stores are still a bit behind the times. They do have some vegan options, but the selection is limited and often out-of-stock. It’s nice that Fratello is helping us to fill in the gaps. After we ate this delicious meal, Amelia found out her pineapple allergy is still alive and well. 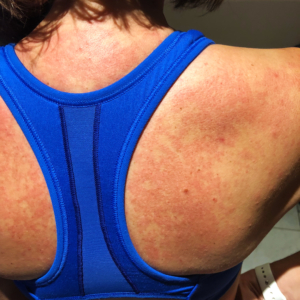 Normally, cooking pineapple seems to make it safe for her to eat, but about 30 minutes after dinner, she broke out in hives all over her body. They lasted about an hour and then went away, thankfully. 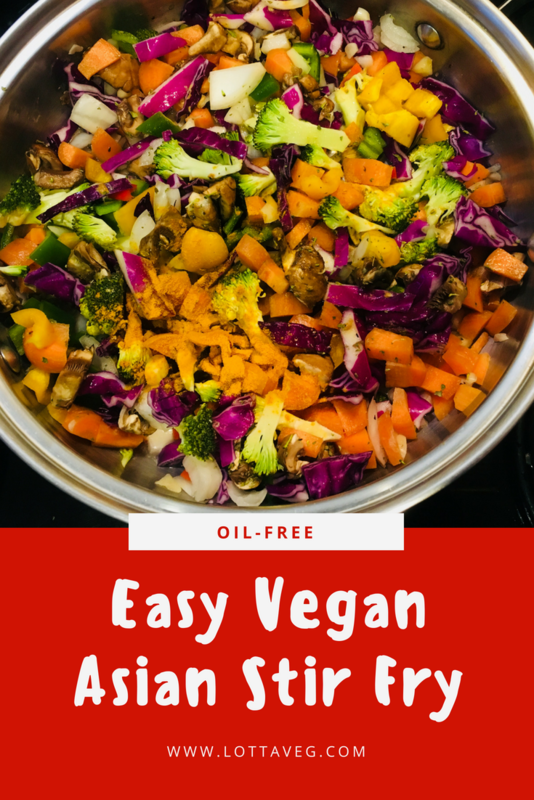 This Easy Vegan Asian Stir Fry that’s oil-free is one of our staple recipes. We eat this one usually once and sometimes twice per week. We typically serve it over healthy brown rice, but sometimes we eat it plain or over some boiled yellow potatoes. We almost always have the main ingredients on-hand: broccoli, cauliflower, peppers, mushrooms, onions, red cabbage and garlic. But feel free to use whatever you have on-hand or need to use before it goes bad, like green peas, snap-peas, carrots, sprouts, spinach, etc. Be creative! 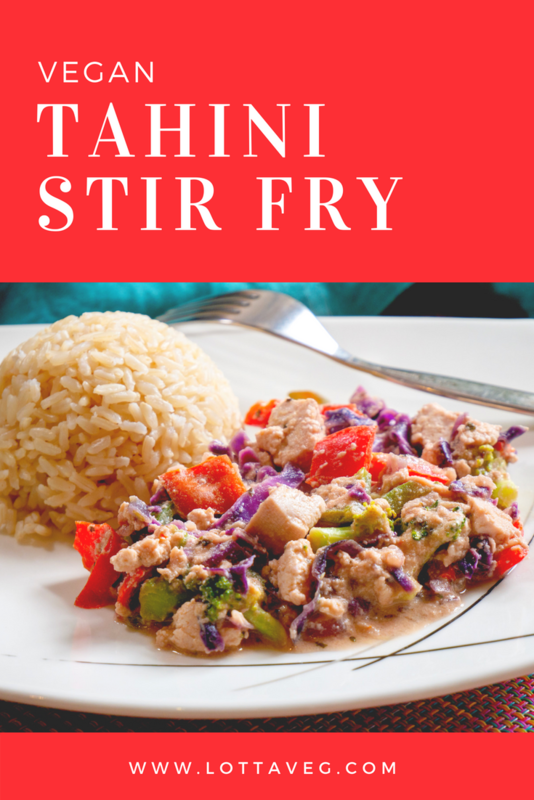 This recipe has lots of protein, fiber, iron and enough vitamin C for 3 days RDV. With the soy sauce and salt, it’s a little high in sodium, so feel free to skip the salt and/or use low sodium soy sauce. Instead, we sauté using our homemade Easy Vegetable Broth from Scraps. It doesn’t add many calories, but it does add a lot of delicious flavor. Since this recipe is so low in calories, but high in nutrient density, it’s a great weight loss recipe. Skip the brown rice and eat it plain to reduce the calories even more. 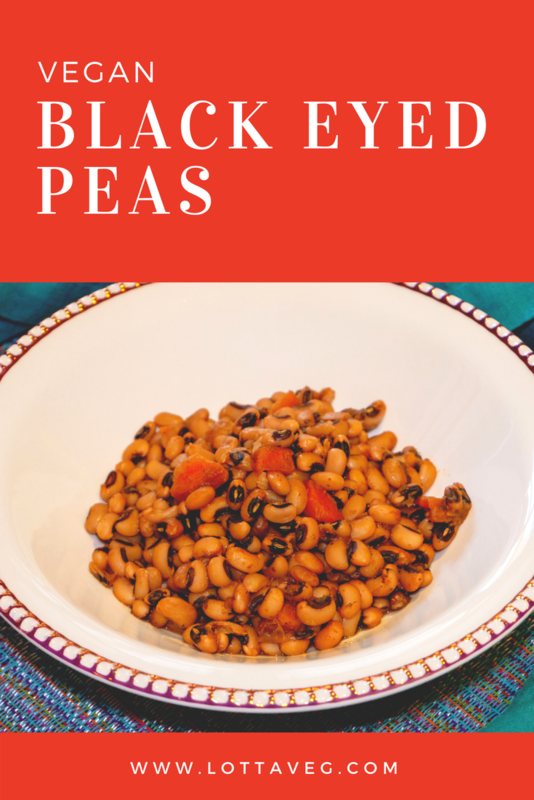 This Vegan Black Eyed Peas recipe is one of my favorite dishes, even though I didn’t like black eyed peas before switching to a plant-based diet. Along with cucumbers, beets and onions, they’ve joined the growing list of foods that I didn’t like before, but love now. Black eyed peas are loaded with protein, fiber and iron. One serving (about 1 cup) has 18 grams of protein, 10 grams of fiber and 42% RDV of Iron with only 263 calories. That means this recipe is not only nutrient dense and filling, but it’s also relatively low calorie. That makes it a great weight loss recipe, too! Black eyed peas are a staple in southern cooking. My mom’s side of the family comes from a small Missouri (pronounced Missour-a in my family) town so we know southern cookin’. When I was a kid, mom always made black eyed peas on New Years day. It’s an old southern tradition that’s said to bring good luck throughout the year. Even though I hated black eyed peas back then, she still made me eat a spoonful…just in case. Well, now I love them and Amelia is kind enough to make them for me on the regular. We normally eat them with a salad, but they would also pair well with another southern favorite, our Vegan Cornbread. 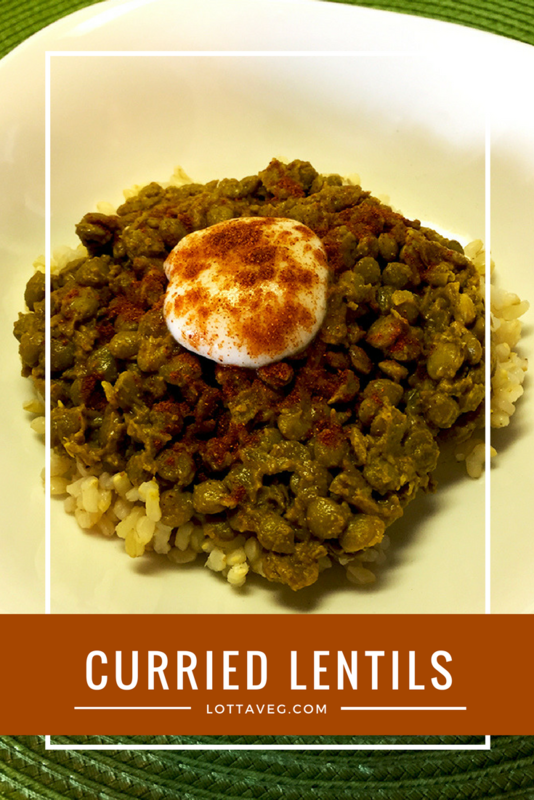 Curried lentils are a favorite of ours. These are super flavorful and fill our house with delicious curry smells. We prefer them over brown rice, but you can also serve them over naan bread, pita bread or your favorite asian noodles. 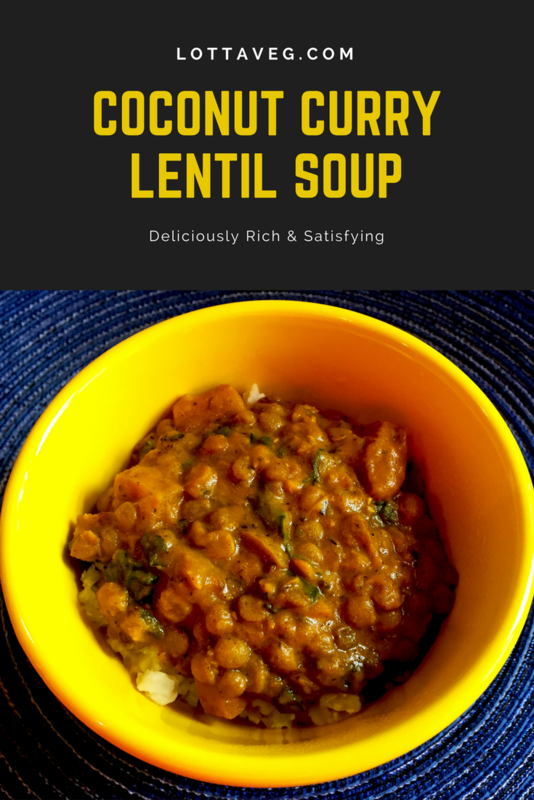 We think green lentils work best in this recipe due to their mild flavor, but you can try other lentils to see which you prefer. Let us know in the comments if you like a different type better. We also like to add a dollop of plain, unsweetened vegan yogurt and stir it into the lentils. It’s a good source of vitamin B12, and it mimics sour cream when served with spicy foods. A sprinkle of paprika adds some nice color and flavor.